Mount Pleasant Granary - Monday 1st. September, 2014 – This diary is now a year old! Up and walked Mix before breakfast, after which Tom and I took all of the seats borrowed for our Saturday event back to Gavinton Church Hall. We called in at the garage to arrange for an MOT for Rachel’s Berlingo and later we delivered it to the garage. Requiring some more rawlplugs, we went to Pearsons and stayed for lunch where, by coincidence Stovies were on the menu – so that’s what we had. 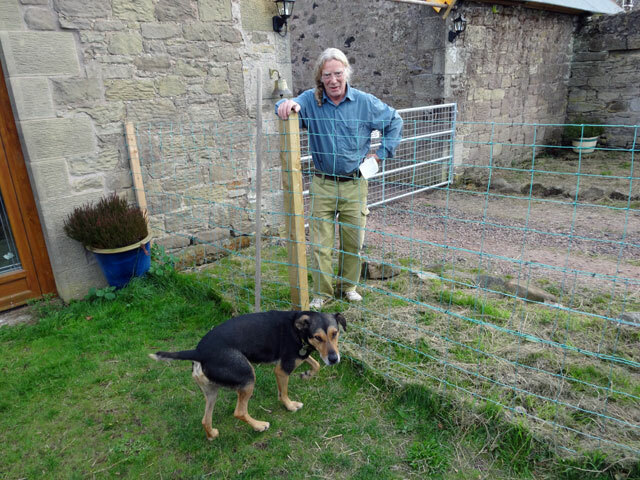 Back at Mount Pleasant, Tom repaired the small gate from the courtyard to the front garden (vital to keep the dogs in). Then, because the sun was shining, we put out two deck chairs, made some coffee, and sat in the sun for the rest of the afternoon like the two old men we have become. It was glorious. Later, my web-site restored (thank you, Andy), I brought it up to date and listened to Durham’s progress in their match against Nottinghamshire. One moment they appear to be doing so well, the next they throw it all away. As it stands at the end of today they have a lead of 261 runs with three wickets in hand. The outcome of the game will be determined in the first hour of tomorrow morning, I suspect. Watched a new New Tricks with Rachel after supper in the farmhouse and then I caught up with the News before walking Mix and retiring for the night. It has been a really good day.